I remember the moment when a dream was born. It was in a movie theater 4 years ago, as I sat wearing ridiculous 3D glasses in a showing of Disney’s Tangled. Instantly, it became one of my favorite movies of all time (let’s establish that I have the mental development of a 12 year old, ok?). Later when the Blu-ray release came out, I immediately purchased it and watched it again and again in the privacy of my own apartment (clearly, I was single then). There was one particular scene I played repeatedly – the one where Rapunzel and Flynn sat in the boat while thousands of glowing lanterns floated around them. I teared up each time. I’ve never seen anything so beautiful, in real life or in animation. It was pure Disney magic. A couple of years later, I would meet D and he would tell me that this isn’t only in fairy tales. It just goes to show how little I knew of the world that I had no idea that such floating lanterns were real! 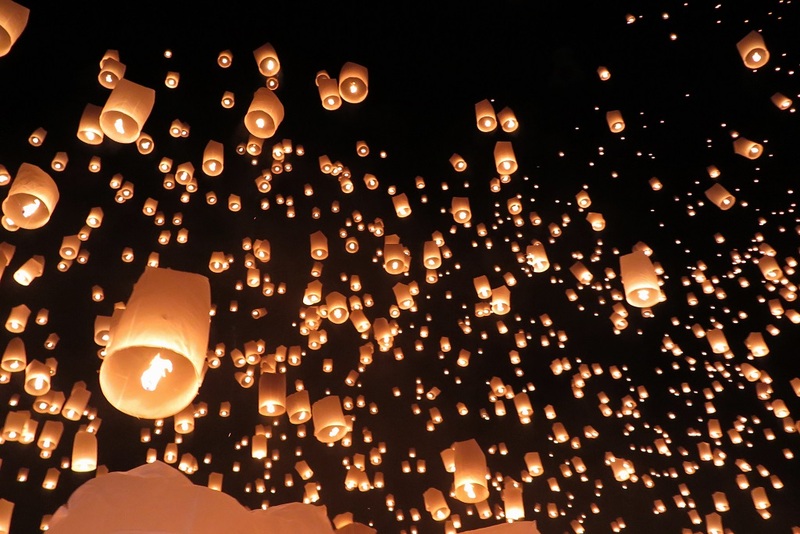 And not only in the sense that such an invention exists, but that there is actually such an event where tens of thousands of people gather to light such lanterns and release them into the sky. Call me easily impressed or naive, but I was *mind blown*. I KNEW I had to someday see it for myself. I’ve always held a fascination for Thailand and dreamed of visiting. But now, this bumped up Thailand to the top of our list. It was even better when we found out that this lantern festival happens around the same time as my birthday. 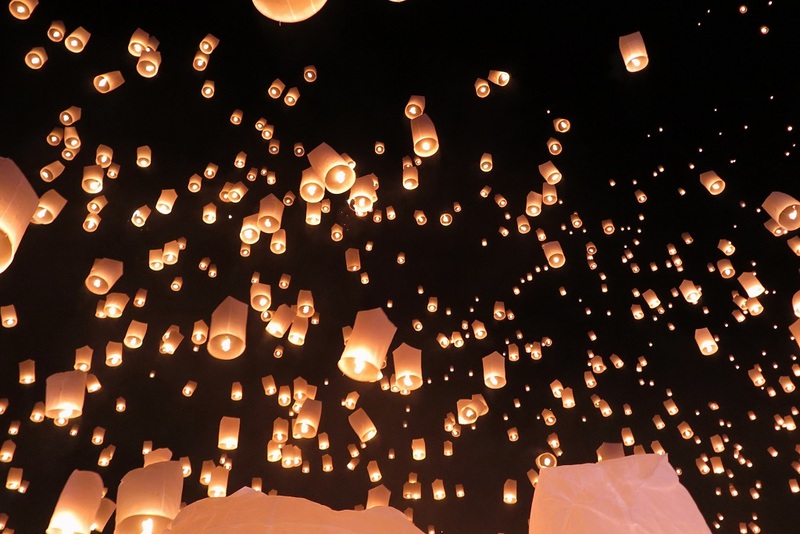 And so this year, I only had one wish: to see the floating lights in Chiang Mai. We’d planned and planned for this moment. We booked plane tickets and an apartment, researched the date/location (as the date is often kept secret until shortly before) and confirmed, even rented a hotel room at the last minute to be as close to the event as possible. But still somehow, that evening as I found myself in a midst of a crowd of a hundred thousand people, it didn’t feel real. Is this really happening? How did I get here? We stood shoulder-to-shoulder in the massive crowd, our skins sticky as humidity and a palpable excitement hung in the air. All up and down the lawn, as far as the eye can see, were rows upon rows of torches, speared into the grass. The monks sat up at the front of the lawn on a tiered half-moon stage, chanting in unison. The whole place was positively buzzing with energy. Finally, after what seems like a lifetime of anticipating, the torches were set aflame, thousands of lanterns were lit all at once, and the countdown began. My heart raced. Do you know that feeling – the moment right before a dream is about to be realized – when a tiny flicker of fear flashes across your mind? You’re so excited and nervous at the same time. Is it going to be everything you dreamed it would be? What if it doesn’t measure up to what you’ve built up in your mind’s eye? You’re scared that this perfect, perfect vision you’ve envisioned won’t be that way at all, leaving your dream trampled on the ground. I held my breath as the first few straggling lanterns rose up. Then more and more, until thousands floated over my head as they peacefully ascended toward the heavens, lighting up the night sky with their ethereal glow. And it was beautiful. No, beautiful doesn’t even begin to cut it. For the first time, I’m at a complete loss for words. 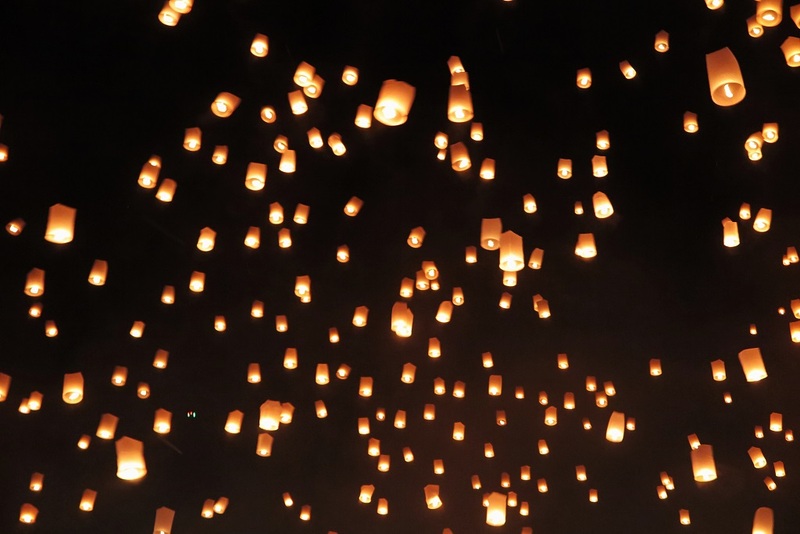 I stood rooted to ground and looked up to the sky of glowing lanterns, grinning from ear to ear as tears gathered at the corners of my eyes. I was spellbound. This was magic come to life. This was a magic that even the best Disney animator couldn’t create. The crowed collectively ooh-ed and aah-ed. People jostled against each other for the best filming angles. The dense heavy air wrapped around us like a warm blanket. Normally, I would find an environment like this to be suffocating, but not tonight. Tonight, it was electrifying. There’s something so special about the act of people from all corners of the globe coming together to create something so beautiful. As I watched the lanterns float up to the sky, one in particular caught my eye. The words “Dreams Come True” came into view as the lantern was lit from within. I watched as the lantern was released into the sky. Up and up until it was just a tiny speck, merging into the sea of glowing lights, the words disappearing into the night sky. 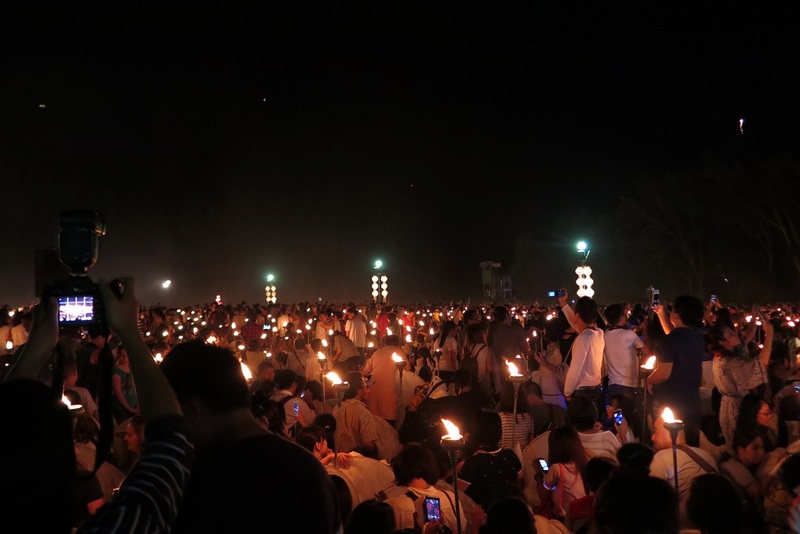 What: The Mae Jo/Sansai coordinated mass release is NOT the same as the Yi Peng Festival. This is organized by a private Buddhist sector and is an event not part of the official festival or endorsed by the government. 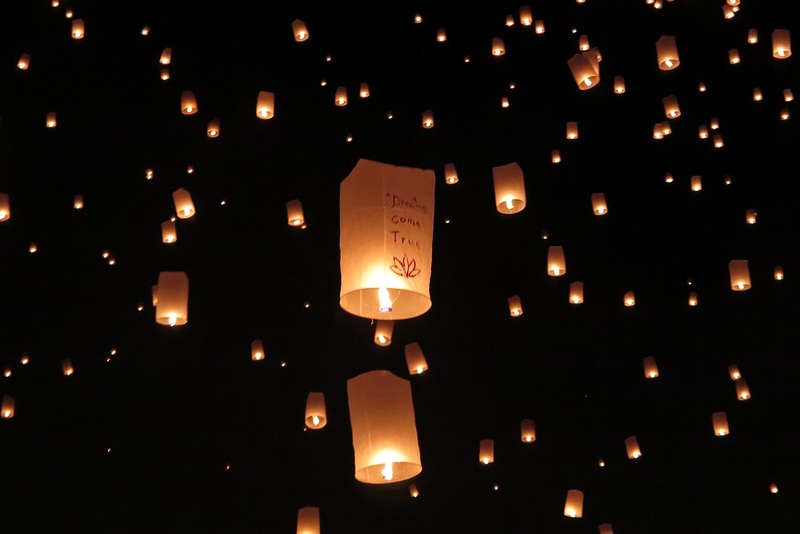 However, this is the ONLY mass coordinated lantern release during the festivities. Date: The date is often kept secret and unannounced until shortly before, but it is usually a couple of weeks before Yi Peng (which is usually early November). This year, it was on October 25th. Location: next to Mae Jo University, about 13km from Chiang Mai’s town center. Cost: The Buddhist event is free. There is a second similar tourist event a couple of weeks later for US$100. However, the word has definitely gotten out on this event, and there are just as many tourists as locals here, if not more! Rules: Strict dress code is enforced at the Buddhist event. Long pants and covered shoulders required, otherwise rejected entry. Time:The Buddhist ceremony starts at around 3 pm, while the lantern release starts around 7 pm. To get a premium seat on the lawn, you’d have to go in the early afternoon. We arrived around 6:30 pm and only managed to get a standing space on the edge of the lawn. Other recs: Traffic will be very congested before and after. Think 100 thousand people exiting at once. I recommend staying out by Mae Jo University the night of the event. We stayed at Banphraya Lanna Hotel, 20 minutes walking distance to the event. I highly recommend this hotel! This post is linked up to Weekend Wanderlust with Justin Plus Lauren. OMG YES!! Then we can watched Tangled like everyday together (D hates it when I watch it! Which I did 3 times in the past week since this event). I want to come back to Chiang Mai every November to see this now!! Let me know if you are coming next year… that’ll be awesome! I’m impressed with your dream and how you really enjoyed it. Most people I know from Stateside actually do not like this. Mention floating lanterns and the only thing they can think of is environmental pollution (bloody morons).. What?! I can’t believe ANYONE would complain about this!! It’s the most beautiful thing ever! I did wonder what happens to all those wire frames once the lantern has burned out, lol. I suppose they all just fall back down to the ground. How neat to see something like that realized, though I feel a bit claustrophobic just imagining being there! I don’t like crowds either, but it’s really magical! And you’ll be okay with the crowd since the more people there is, the more beautiful it will be :D.
Exactly! When you have one of those moments, you remember why travel is so amazing!! I’ve had a few too, but none as huge as this one so far! Wow! What an amazing experience. Dreams do indeed come true. I felt like that when I walked the streets of Pompeii. Oh I bet that’s soooo amazing to be somewhere with that much tragic history. Those “I’m watching my dream come true!” moments are what makes travel so fun and exciting! How cool that you actually got to be there after wanting to see this in real life for so long! I bet it was a surreal experience! It was definitely surreal! And especially when all those lanterns went up, it was really magic! I can’t think of a better word to describe it!! 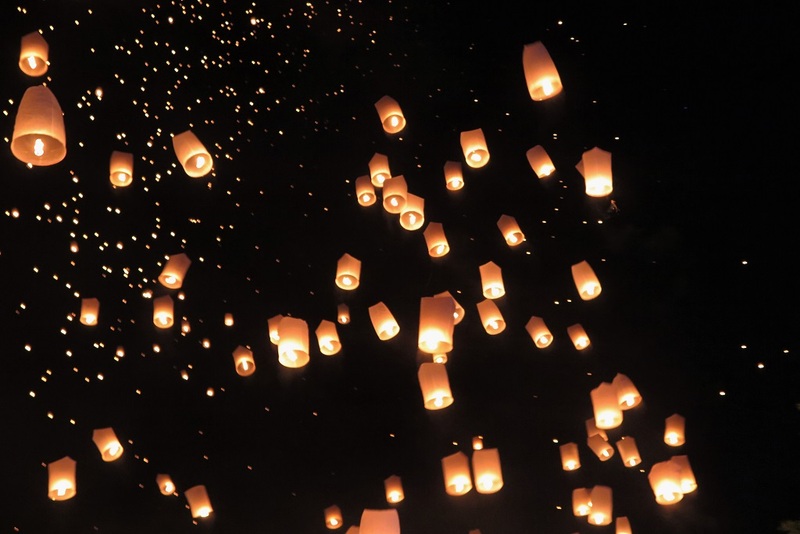 I think I already told you this somewhere on social media, but being in Chiang Mai for the floating lanterns has been something I’ve wanted to do for so long! I love the lanterns so much I actually tried orchestrating something like this for my wedding, but that plan was a FAIL!!! I’m so happy you got to experience this Anna, and the way you’ve written about it is just beautiful! Thank you so much Upasna!! I really really hope you make it there!! Just remember.. there is only ONE mass release like that (in Mae Jo, a little ways from the CM town center), and it usually happens a couple of weeks before the official Yi Peng celebrations. You may not be able to find out the exact date until a few weeks prior, so it’s probably safer to just be there for a couple of weeks so you don’t miss it. And omg, I can imagine that being SO pretty during a wedding!! One time, one of my friends got some lanterns to set off in the desert, and it was a fail too, lol. Yesssss, you, me, and Hannah will have a Tangled marathon! It really was SO magical! Just something that I couldn’t believe I got to experience in person! Wow. Your photos are amazing, Anna! Seeing them from the perspective of an actual person (you, as opposed to a stock image in a ’10 Things You MUST See Before You Die’ list) is so different! Makes it seem so much more real. Just beautiful. What an experience! Thanks so much Terri! It was really one of the best experiences I’ve had so far! Sometimes, I still can’t believe that I actually saw it in person. This is definitely on my bucket list! Thanks so much for sharing. Hopefully someday I can make it down to Thailand at this time. Ah, I love these photos! That scene from Tangled is one of my favorites too. I’m going to go watch it on YouTube now. . .
Haha I bought Tangled my iPad recently because this event made me want to watch it again (I don’t have my blu-ray anymore). And I’ve watched it multiple times since! I hope you’ll plan to go to Chiang Mai again for this festival! I really think it was one of the best travel moments I’ve had. You’re right – it’s moments like this that confirm that the experiences we get while traveling is truly priceless! How magical! And weirdly enough, when you look at the photos the lanterns look like they’re floating up! I’m not sure I’ll ever get to see it in person, but it sure is wonderful to be able to see your photos and read about it. This might just be one of the prettiest things I’ve ever seen! Amazing! The way you describe it makes it seem even more magical. I have GOT to do this someday. Thanks for all the tips at the end, too. If we actually get to see this one year, they’ll come in handy! Thanks so much for stopping by Sarah!! I really hope you get to see this someday! I can’t even describe how magical it is. Just remember that this event is NOT the same as Yi Peng and usually happens a couple of weeks before it :). A lot of people mistaken it and miss it because of it!